The TTC has announced that the 501 Queen service will revert to its normal routing between Broadview and Coxwell effective Monday, September 24. Service on Kingston Road will continue to be provided by buses for the remainder of the current schedule period. Plans called for the 502 Downtowner to operate from Bingham Loop to Wolseley Loop at Bathurst Street, and the 503 Kingston Road will operate from Bingham to York & Wellington effective Tuesday, October 9 (the first weekday of the new schedule period). For the next two weeks, we should see amazingly good service on the outer ends of the 501 Queen route because cars will have the extra running time for a diversion they are not taking. This will be an interesting point of comparison once the normal running times return with the October 7 schedules. Rail installation is now in progress east from Greenwood to the west gate at Russell Carhouse. Looking east on Queen from Greenwood. The strings of new rail have just been pulled into the worksite and are being positioned for installation on the ties below. The special work at the west gate is in place but not yet connected to the surrounding track which must be cut to size. Excavation from the west gate at Russell Carhouse west to Greenwood is complete, and the foundation layer of concrete is being poured this morning (see photo below). The Greenwood bus diversion information has been corrected by the TTC and the stops are now signed to indicate where the bus is actually running. The Queen shuttle bus route now operates only to River Street (signed “501 Broadview”) because the link from Queen to King has finally reopened after construction. Buses loop west on Queen, south on River and return east on King to the Don Bridge. This week, carhouse access at Russell switched from the west gate to the recently completed track at the east gate at Connaught. Demolition of the existing trackwork between the west gate and Greenwood is in progress today (see photo below), and a diversion notice for the Greenwood bus has been posted giving dates of August 23 to 31. This notice makes interesting reading because it claims that the 31B service to Eastern Avenue will divert east via Queen and south on Coxwell even though this is physically impossible with the construction now underway. Meanwhile, on a visit to the site this morning, I noticed that there were few announcements of the diversion posted, notably at stops with no service, and that only one of the Greenwood buses then operating actually took the diversionary route. The TTC is now aware of the problem. Excavation and removal of the special work at the west gate of Russell Yard. Toronto’s streetcar system once had many quaint corners, but over the years these disappeared to track replacement and paving work around the city. Connaught Avenue remains an anomaly, a well-used piece of single track on an otherwise quiet residential street. This track provides the main access to Russell Carhouse and its ladder track on Eastern Avenue. Reconstruction has now progressed to the point where Connaught’s track is wide open, probably for the last time many of us will see such an event. Looking north on Connaught from the point where the north and southbound tracks used to join. The jig bolted around the track in the foreground is used to hold rails in position for welding. Previously completed welds are visible further back, and these have not yet been smoothed off. This is an odd, short section of track where, unlike the main tangent track on Queen itself, much of the rail is not pre-welded in strings. Looking south on Connaught where the single track passes between houses on this narrow side-street where, normally, parking is allowed. Looking north on Connaught from Eastern. Behind me is the curve onto Eastern which, together with the ladder track and approaches to the carhouse and yard, will be rebuilt next year. At that point, the streetcar lane will become a reserved area and Eastern Avenue will be narrowed to include one traffic lane and a sidewalk beside the new ladder track. The next major work at Russell Carhouse will be the replacement of the special work at the west gate (east of Greenwood). This is scheduled for September. During that work, all carhouse access will switch to the east side via Connaught and the recently completed new track east to Coxwell. 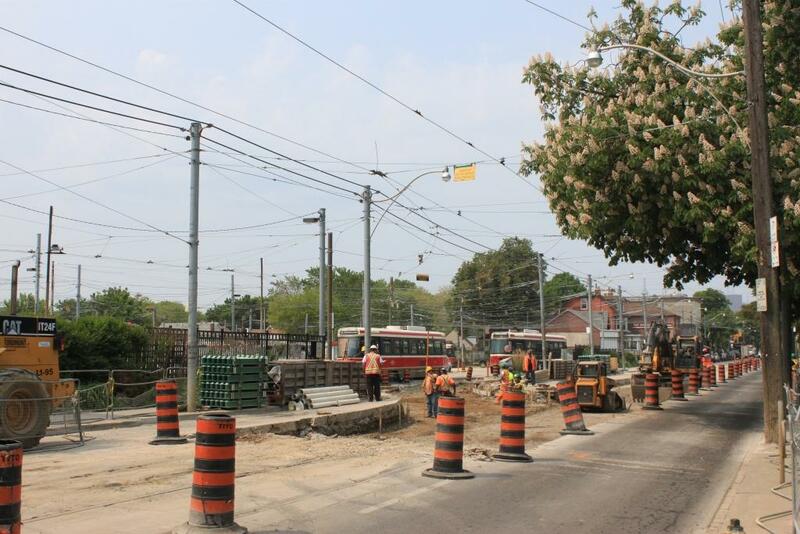 Track installation and paving is mostly complete in the block from Kent Road west to Connaught Avenue, and work is concentrating on the east gate of Russell Carhouse. Looking north on Connaught. The painted wall on the left of the photo is the east wall of Russell Carhouse. Looking west through the eastern gate of Russell. The track panel for the trailing switch that will link the track from the trailer yard with the ladder from the carhouse is sitting on a float in the background ready to be installed. Looking east from the trailer yard toward the east gate. 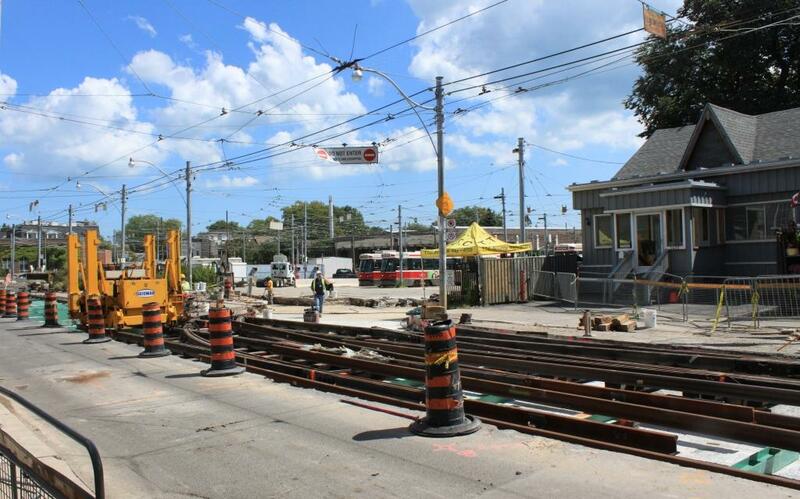 The TTC has issued a notice about streetcars queuing eastbound to Russell Carhouse starting Monday, July 30. 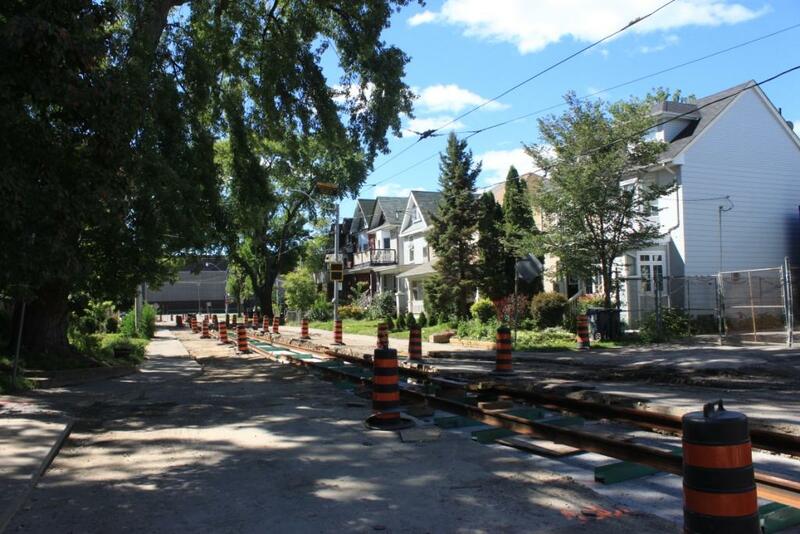 Because the Connaught Avenue trackage will be under construction, all cars returning to the carhouse must be backed onto their tracks and this will create a queue of streetcars waiting to get into the yard. 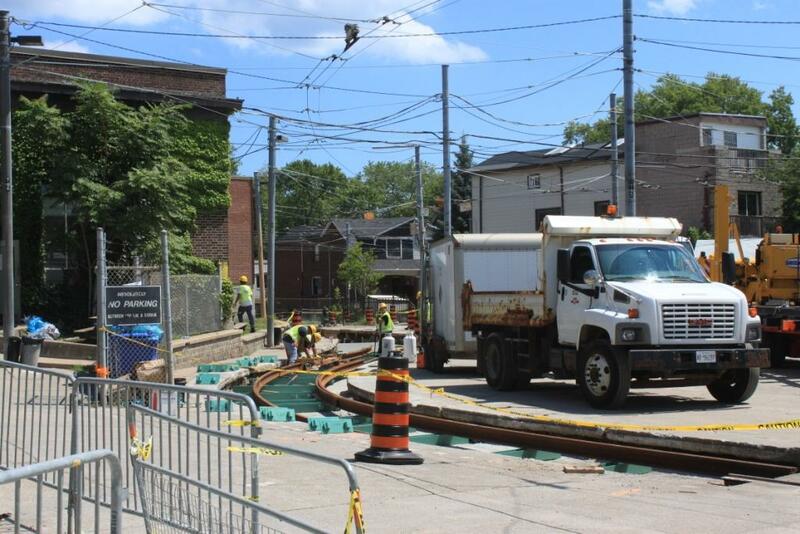 The original start date for the Connaught Avenue work appears to have been pushed back from July 26 (tomorrow) when 501 Queen cars would still be attempting to operate to Russell Carhouse until next week when they will all divert via Gerrard. 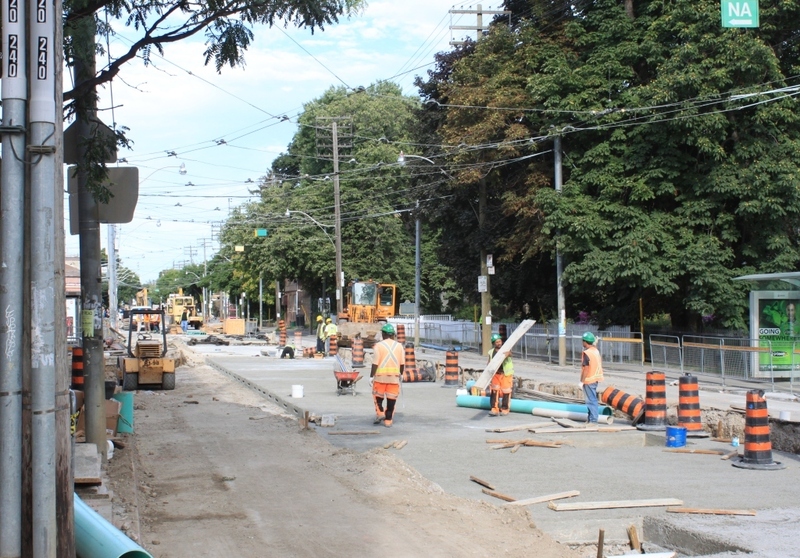 Meanwhile, the TTC’s diversion notice states that the Gerrard diversion will operate until October 2 when the track project on Queen will be complete. 503 Kingston Road service will also resume at that time, but the 502 Downtowner route will remain as a bus shuttle until mid November due to ongoing water main and track work at McCaul Loop. By mid-afternoon, most of the intersection of Queen and Connaught was assembled on street. 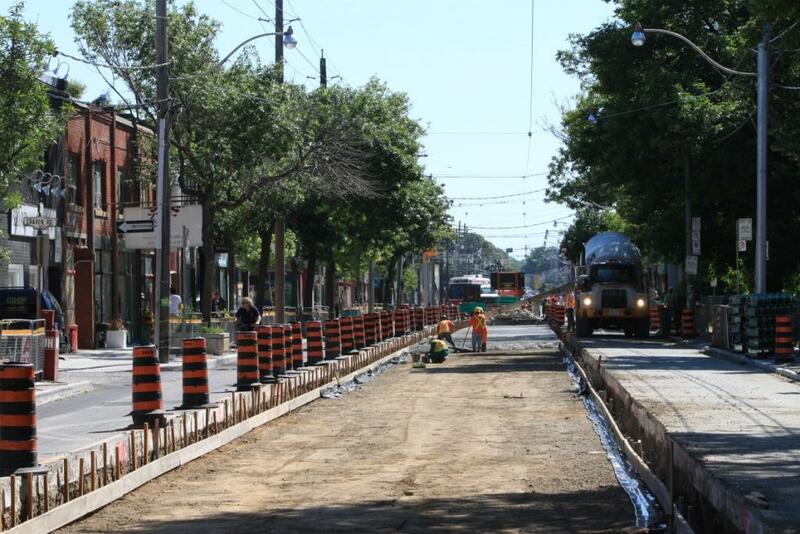 This view looks east on Queen across the newly installed special work. Looking south on Connaught from Queen. Looking west on Queen toward Connaught. 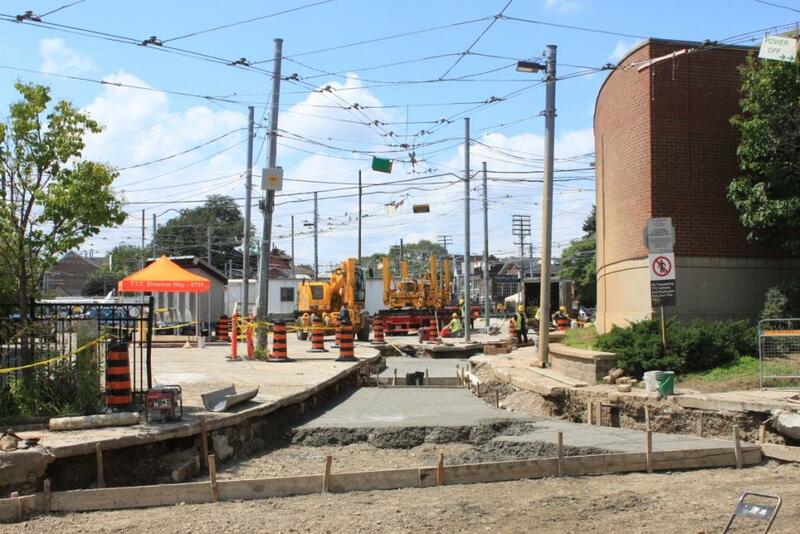 The foundation concrete is in place from Kent Road to west of Connaught, and excavation of Connaught south from Queen to the east gate is in progress. 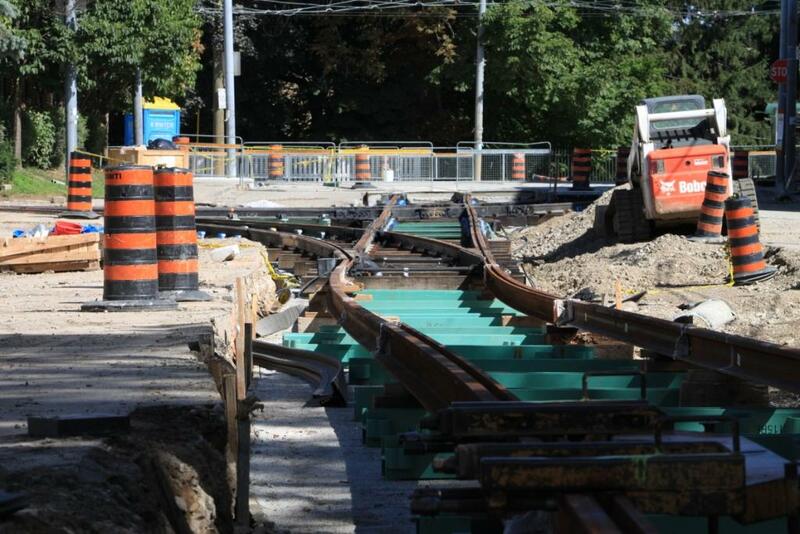 Track panels for the replacement intersection are spotted along Queen Street and Eastern Avenue. The view below looks west across the intersection from roughly the same viewpoint as the photo in the July 12 update. The new slab is in place up to the point where work left off with the eastern exit from the Trailer Yard. Looking east across the intersection. 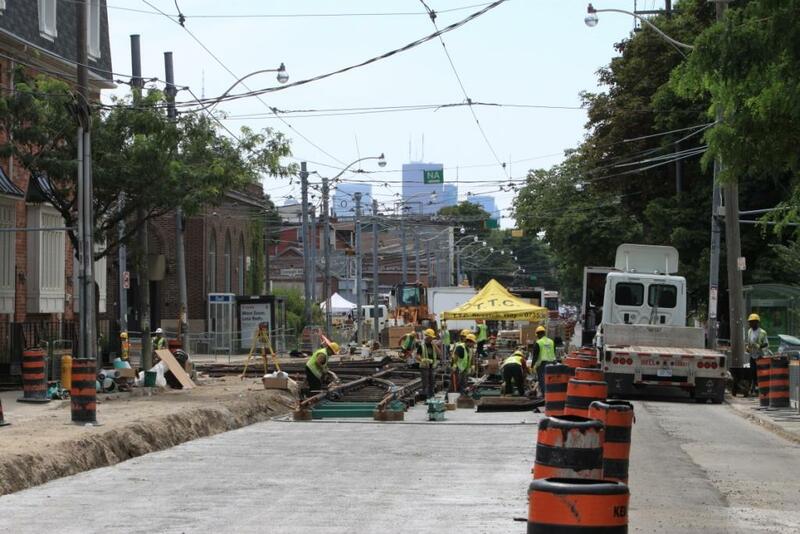 The new slab extends to Kent Road where previous work westward from Coxwell left off. Looking north on Connaught to Queen. This shows the point where the double track on Connaught merges to single track. The northbound rail beyond the switch up to the yard exit will be removed when this section is rebuilt in the next phase of work. During that period, access to the yard and carhouse will be handled by reversing cars from the ladder tracks in the north end of the yard. 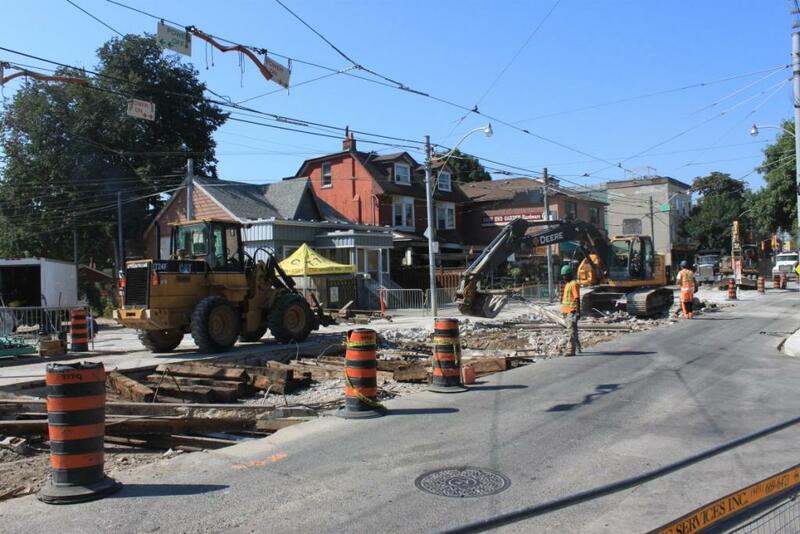 The construction notice for the next phase of work on Queen East has been posted on the City’s website. 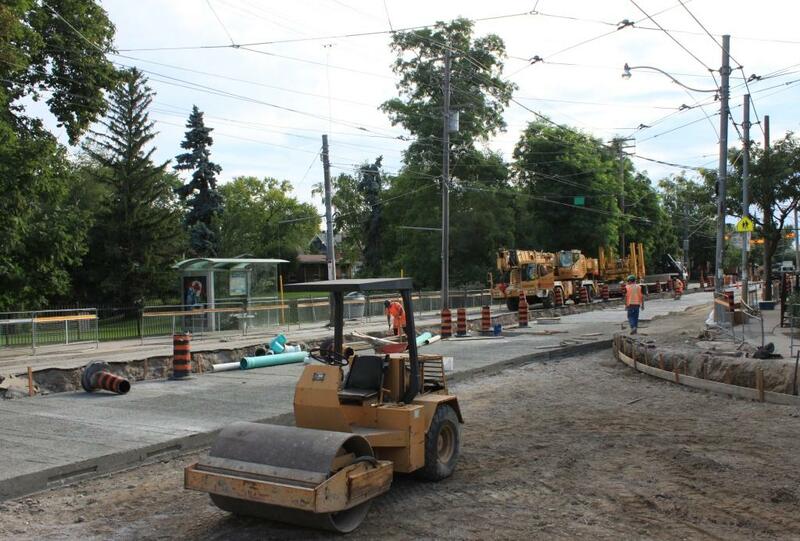 Work begins today west from Kent Road toward Connaught to finish off the link east to Coxwell from Russell Carhouse. The intersection of Queen & Connaught will be rebuilt starting on July 19. 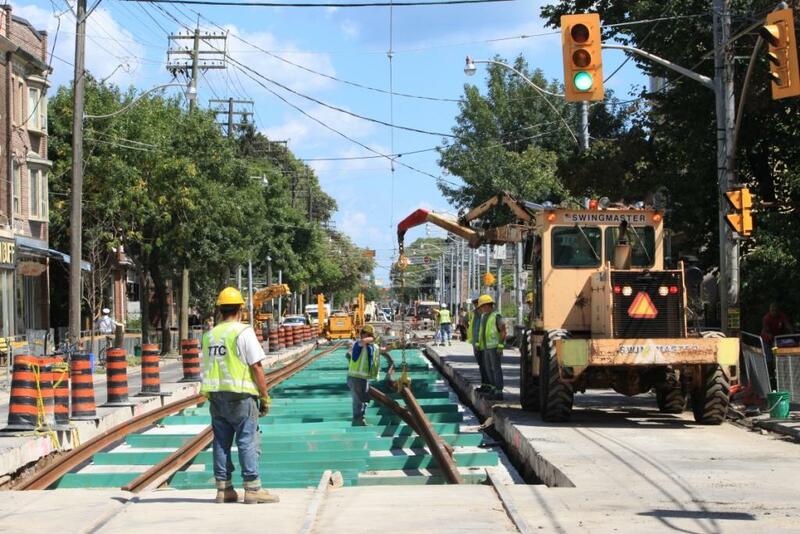 Track here was already partly removed for work by Toronto Water. Over two weeks have been reserved for this work although it is considerably simpler than the full intersection replacement at Spadina & Queen. Replacement of the east exit from the yard onto Connaught is scheduled for July 26 to August 3. Operations at the yard will be constrained while access to the runaround track is suspended. When I have further information about arrangements for this period, I will update this article. When Connaught Avenue has been rebuilt, the last remaining on-street crossover will be removed from the system, and it will no longer be possible to reverse cars so that they face south in Russell Yard. Work on reconstruction of the Eastern Avenue ladder track has not yet been scheduled. This will include raising the level of the track to reduce the grade on the curves into the south end of Russell Carhouse. Five days later, June 20, the track is in place. Looking west from the same point shows the track assembly in progress from Ashdale west to Woodfield. The bits and pieces await assembly. Schedule changes planned for the end of July (to be reported in detail in a separate article) will see carhouse access revert to the east side of Russell while the track at the west gate is rebuilt. 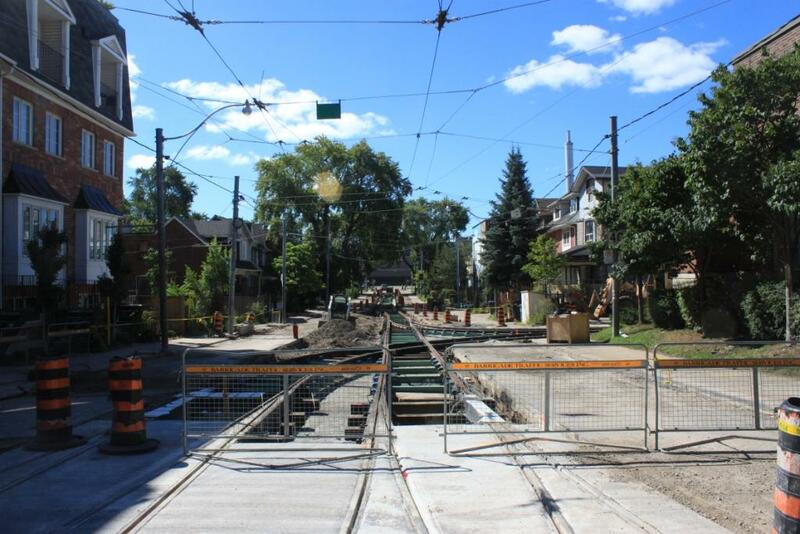 Streetcars will operate through to Neville with a diversion via Broadview, Gerrard and Coxwell. 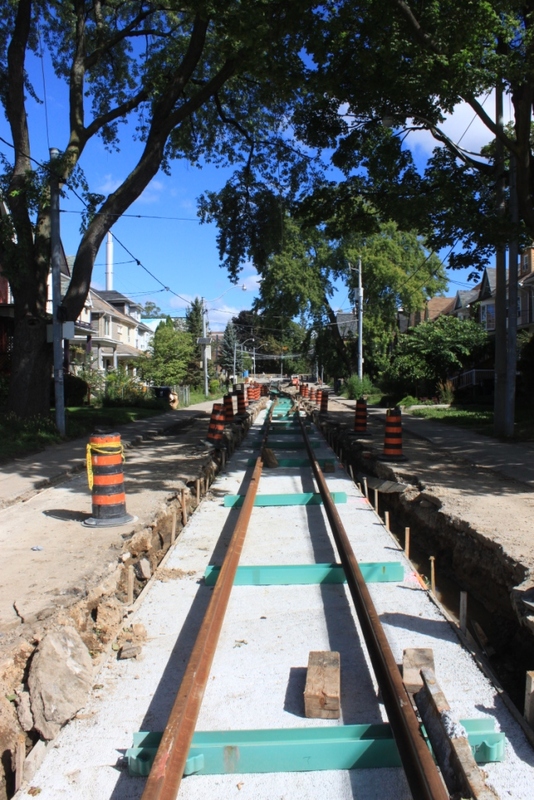 Track excavation has begun westward from Coxwell. At Connaught, part of the intersection has been removed for water main construction across the south side of the intersection. 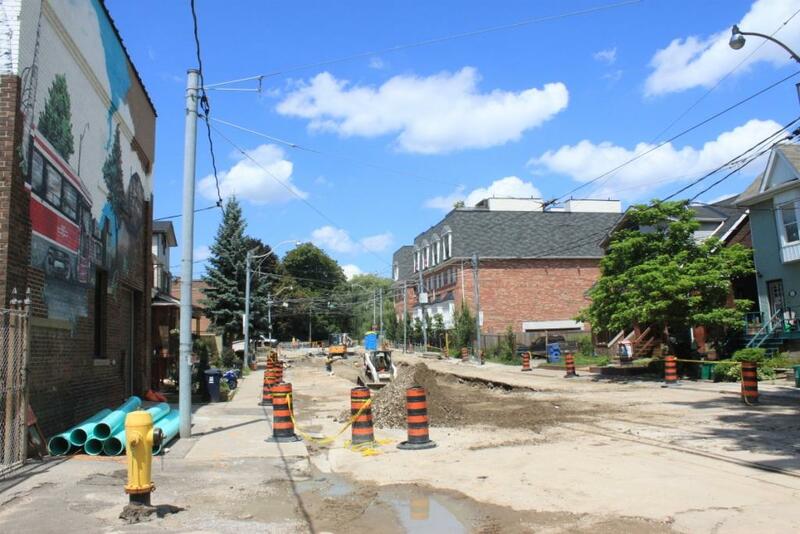 Local watermain work is underway on Connaught Avenue and will continue on Queen east of Connaught. This needs to finish before the larger work of track replacement can get underway. The special work installation at the eastern entrance to Russell Trailer Yard is underway as seen in this photo from May 31. 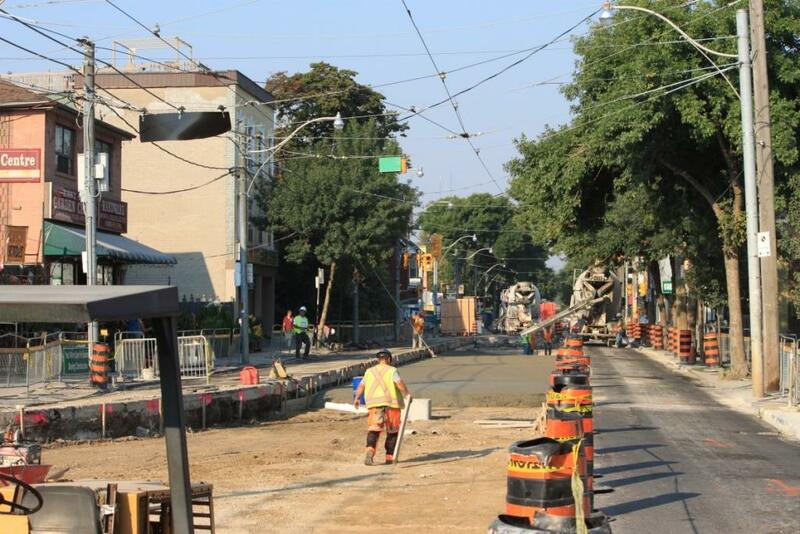 New sidewalk construction is almost complete from Woodfield Road east to Coxwell on the south side of Queen. Little else seems to be happening in this area probably because work is concentrated in front of the carhouse. From west of Connaught to Vancouver (a small, dead-end street near the west gate of Russell Yard) Queen is excavated for track replacement. This will include the special work at the east gate to the “trailer yard” (so called because streetcars once picked up their trailers by pulling into the north end of the yard) and the tangent rails up to but not including the west gate. The work has not yet progressed to the point of pouring the concrete base slab, let alone any track installation. Looking west on Queen at the east gate of Russell’s “trailer yard”. Looking west from the foot of Vancouver Street. This portion of the excavation is ready to receive its base slab. Queen remains open for through traffic westbound from Coxwell to Greenwood. Eastbound, the street is closed at Greenwood except to local traffic (this allows the gardening store west of the carhouse to stay open during a very busy season). Many motorists erroneously drive east only to discover that they have to make a U turn (or some other creative manoeuvre) to go back west. The Phase 2 Construction Notice gives more details of the planned schedule for upcoming work. 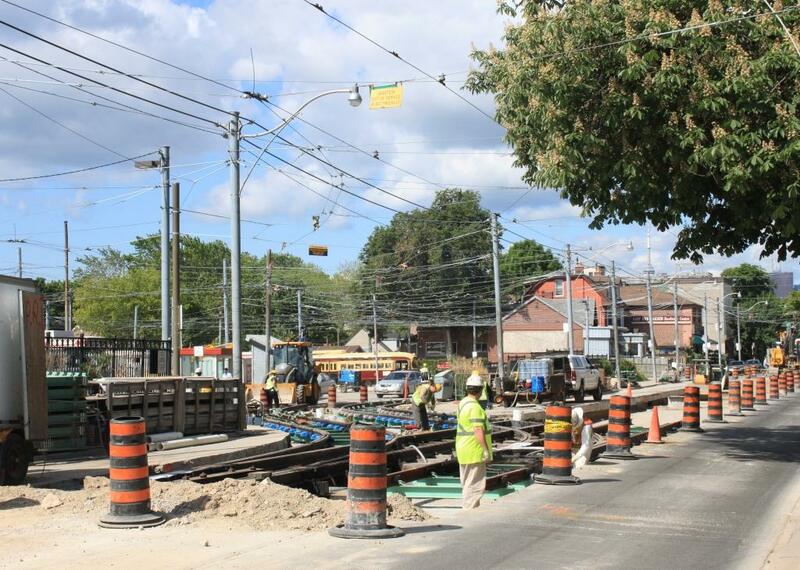 The closure east of Greenwood beginning after the Victoria Day weekend will allow replacement of the tangent rail on Queen between the two north entrances of Russell Yard. Replacement of the special work will follow at a later date. The track replacement will generally move west to east following behind the watermain, road and sidewalk repairs. The eastbound traffic diversion will remain at Connaught until May 21 when the road closure will shift west to Greenwood. A one-week closure of the Queen/Connaught intersection is planned. New sidewalk construction is underway on the south side east from Woodfield and has progressed almost one block to Woodward. Sidewalks in this stretch are generally in bad shape from past years’ construction projects. 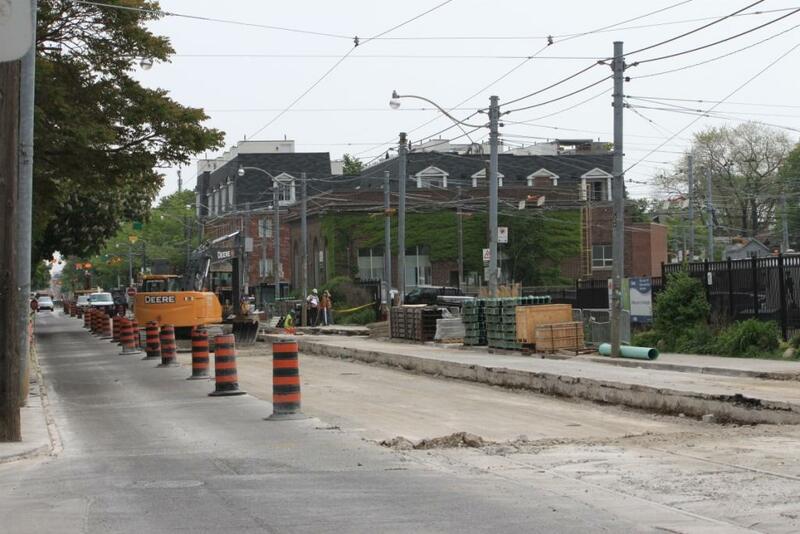 The track from west of Connaught to west of Coxwell has been cut into sections in the roadway to simplify digging up the trackbed. The rate of work does not appear to give any sense of urgency. Some riders report that buses signed “Parliament” are actually kicking off passengers westbound at Broadview. Many Queen cars are short-turning at Broadview making the overlap between services less than originally planned. A Queen car that short turns does not serve the westbound stop where buses drop their passengers. Overhead power cut from the east gate of the “trailer yard” at Russell to just west of Coxwell. Cars can access the carhouse only by running through the yard from the northwest entrance and then turning south on Connaught. Congestion may occur on Connaught when there are many streetcars as well as diverting road traffic using Connaught to reach (and turn left at) Eastern Avenue. Streetcar and bus service is erratic. Buses are looping west via Parliament rather than via River as originally planned because Carroll Street, originally conceived as the southbound leg of the loop, has been closed for one block for a new park. This was approved by Council some time ago. This entry was posted in Queen Car, Service Cost and Quality, Transit. Bookmark the permalink. 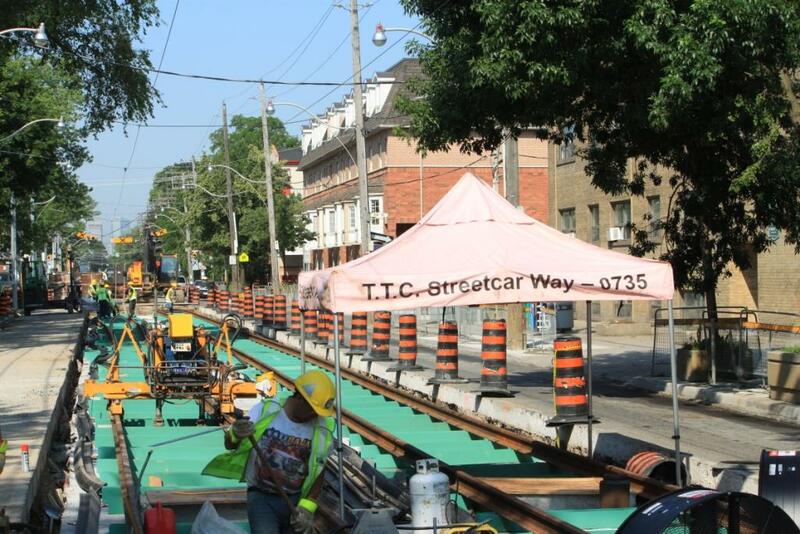 Side note: am surprised to see the term “Streetcar Way” on one of the tents in the photos above. I haven’t seen this term used outside of old archival photographs. Was this name ever formally retired, or has it been plucked back from the depths of TTC antiquity? Steve: I think it has always been around. To all the people who say that the streetcar tracks are falling apart today.. think again. I just came across this photo from 1920 showing tracks in far worse condition that anything we have today. Just goes to show it could be A LOT worse. Steve: That is one of many photos taken to document the appalling condition of the Toronto Railway Company’s track by the end of their franchise. They knew that they would not be renewed in 1921 because of their refusal to expand their network beyond the 1891 city borders, and just let their system fall apart. A marvellous example of private enterprise that led to the creation of the public Toronto Transportation Commission. I don’t know if this has been discussed yet (haven’t read through all comments), but a simple, often used loop exists for the Queen car (to say nothing of the issues farther west along Queen (w/ the Spadina work), but proceeding eastbound to Parliament, north to Dundas, east to Broadview, south to Queen and back westbound is a simple, sound, logical loop. The shuttle buses would run from Neville Park loop to Parliament looping King-Parliament-Queen. This would provide 100% of service along the route. I checked Google maps, and the above streetcar turns appear to be running. Steve: Actually this loop can be used in either direction, and is normally operated counter-clockwise (Broadview-Dundas-Parliament). This allows a car to lay over southbound on Parliament for its correct time westbound. 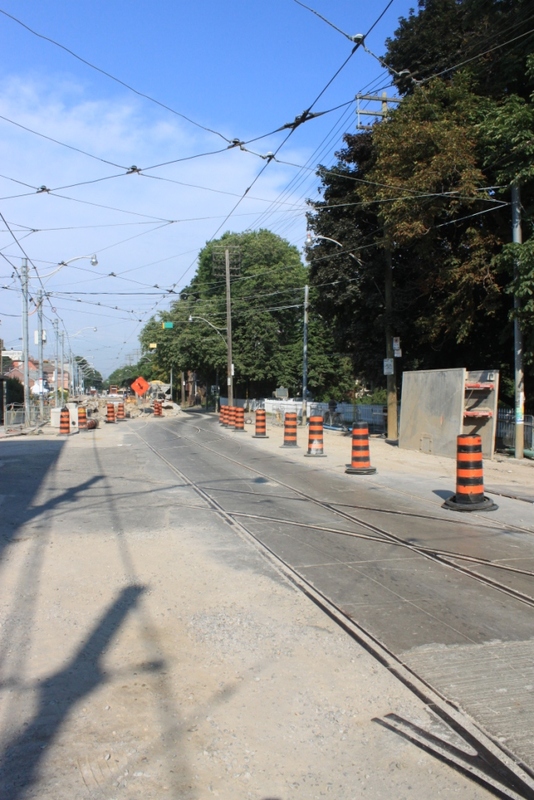 All this will be moot in a few weeks when streetcar service returns to Neville on July 29 with all 501s diverting between Coxwell and Broadview via Gerrard. Shuttle buses will only go as far east as Woodbine Loop. The “501 Bathurst” cars (which are really 502s in disguise) will operate to Broadview Station. Looping shuttle buses via King and Parliament would be difficult because of the very tight turn of over 90 degrees west to north. The current loop via Parliament-Shuter-River may not last much longer as the short section of River from Queen to King is now paved (but not yet open). That was originally to be the loop for the bus shuttles. 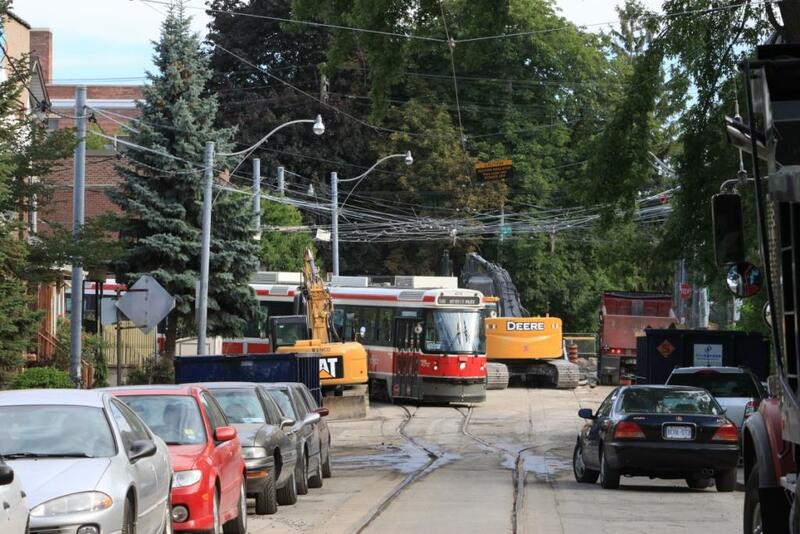 How can streetcars turn from Coxwell onto Queen? Isn’t the switch set up for the opposite direction at Coxwell in order to turn cars around? Steve: A car southbound on Coxwell has three choices. Turn into the loop and return northbound. Turn west onto Queen, or east onto Queen. The 501 diversion will take the eastern branch, and westbound service will make the reverse of this turn to go north on Coxwell. The west to north curve is interesting because it also contains the trailing switch for the track coming out of the loop. The other interesting thing about that trackwork (or, at least use to, since I haven’t had a good look there in quite some time) is that the track coming out of the loop forms a gauntlet with the westbound track on Queen as its left rail crosses the right rail of the westbound track. Also this switch is the only one in the entire system I’m aware of that is fully curved all the way through. The buses move faster, they allow traffic to pass around them, and the street in general works better right now. Keep the streetcars in the garage, don’t waste millions on track repairs, and use a bus service on Queen East. Besides “emotional reasons”, there is no logical reason to continue operating these buckets when 100 years of advancements in vehicular technology have allowed us to replace them. Steve: Strange how so many cities the world over have used that century of advancement to improve and expand, in some cases restore, their streetcar/LRT systems. Of course they are also terribly cramped for the passengers and cause a few problems for the many cyclists on the road. I suppose you wouldn’t notice that if you were doing a driveby in a car. As for speed, that depends on driver. I have been on some that go as fast as they can and others that move at snail’s pace. Although the announcement seemed to talk about the buses going into Woodbine Loop (Kingston Road) (though I can’t actually find that now), the NextBus data seems to think the buses are heading to the Woodbine Bus Loop at Lakeshore and Northern Dancer. Although watching the buses themselves at TOTransit shows them going into the Woodbine streetcar loop at Queen/Kingston Road. Seems the loop name is now so obscure that those making the schedule don’t even know which loop is Woodbine Loop! Perhaps it’s time to rename that loop, given the Woodbine racetrack across the street it was named for, hasn’t been called that in over half-a-century. Steve: The maps used by NextBus come from GPS info supplied as part of the TTC’s data feed to describe the route. At times, especially for short-lived diversions, this is out of sync with where vehicles actually travel, and this screws up NextBus arrival projections for stops. Just to give a quick clarification to Nfitz about the loop names. Woodbine loop is the streetcar loop located at Queen and Kingston Road; named after Woodbine racetrack. This is the the location where the racetrack cars would layover or short-turn. Woodbine BEACH loop (originally called Ashbridges Bay Loop when it was opened) is the bus loop located at Lakeshore and Northern Dancer. The bus loop was renamed because people destined for Woodbine Beach got confused when they saw Ashbridges Bay on the schedules! Incidentally, the 92 destination signs read “to Lakeshore”, which is a throw back to the former 92A service which looped via Queen, Coxwell, Lakeshore. Living nearby, I’m aware of the history. I’m sure some would be horrified to learn that I recommended to TTC today that they rename Woodbine Loop, to something that makes more sense to people these days, as clearly the current name can create confusion (if only to TTC staff … perhaps it’s less of a problem to people who actually live in Toronto). Any problems with copper (Cu) wiring being stolen experienced with streetcar and light rail installations in the States? Steve: Given that the carhouse area remains active and a great deal of the overhead is still under power, stealing wire would be a challenge. It’s bronze, by the way, not copper. I just stopped by today to look at the construction progress. I noticed that for most of the new track they are using steel ties (coloured green) but underneath the switches they are still using wooden ties. What it the reasoning for this? Steve: The positioning of the rails in the special work is such that a “standard” tie won’t work. Even the steel ties under curved sections are a bit unusual (although this is not visible now that the assembly is completed) because they have provision for the mounts to be shifted to allow for the slight change in gauge on curves. On the straight sections, the tie-down points for the rail fasteners are pre-welded at TTC gauge spacing. While I agree that Connaught is an anomaly, as a resident of this street, I can tell you that Connaught is anything but a quiet residential street. That said, I knew where I was buying and what that involved. I took a gamble that no city who aspires to be worldclass would leave an operation as large as the Russell Carhouse in the middle of a thriving neighbourhood, but regrettably I was wrong. Connaught Avenue remains an anomaly, a well-used piece of single track on an otherwise quiet residential street. 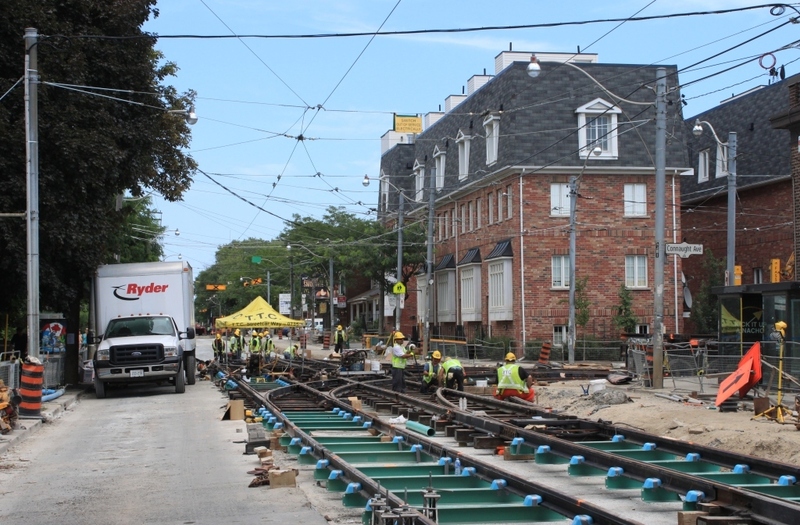 Steve: Once streetcar operation resumes down Connaught, I will be interested to hear whether things are quieter with the new track. Ian, I’m sure if you had a few hundred million dollars to add to the pot, the city might take you up on such an offer. 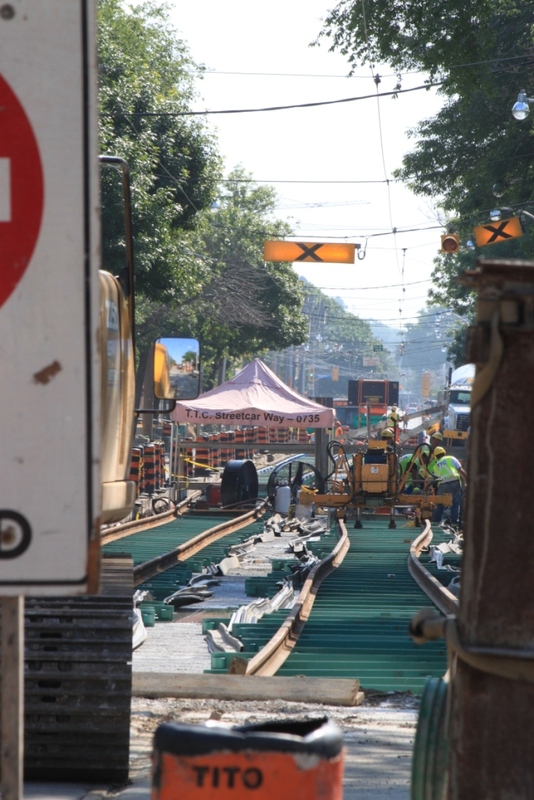 Regrettably the TTC has bigger issues on its plate, like making sure the Eglinton LRT stays in the middle of the road or keeping the DRTES buried. There has been a lot of discussion here about the “new” standards of track reconstruction as opposed to the “old” ones used until the early ’90s. 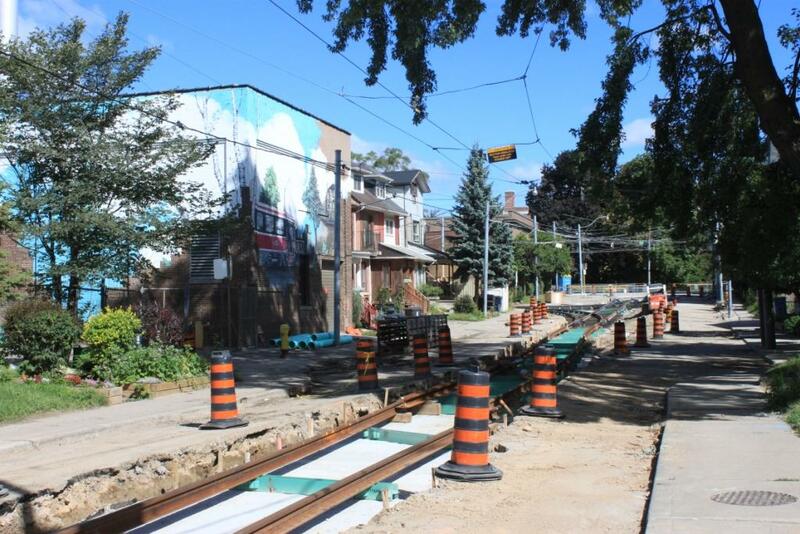 As a long-time resident of Kingston Road and frequent user of TTC services in the area, I remember this very same stretch of track (Queen St from Connaught to Coxwell) being totally reconstructed in the summer of 1994, making it barely 18 years old by the time of this year’s replacement. Given that the TTC advertises the new track to be more robust and last 25-30 years, does anyone know if the switch to more resilient track had already been made back in 1994 (or more specifically, for this particular section of track)? If indeed the “new” track standards were used back then, this brings into doubt the credibility of the 25-30 years theory, especially in the context of significant LRT construction in the suburbs in the near future. Given the (seemingly) considerable public opposition to LRT projects in general, and the sheer volume of misinformation being floated around y the Mayor’s office & co. for the past 2 years with respect to LRT, it will be interesting to see how the seemingly endless reconstruction of existing trackage around the city will be fodder for anti-streetcar/LRT fanatics. Also, as a side note, I am no technical person, but based on the loud rumblings of the streetcars on Kingston Road when they used to run up here and the general deterioration of the trackbed visible to the naked eye, the Kingston Road trackage seems in far worse shape than the Coxwell-to-Connaught segment before this year’s reconstruction. I, for one, can’t remember any major trackwork on Kingston Road in the past 25 years or so. Steve, do you know how old this section of track is and if there any plans to reconstruct it? Given its current state, no wonder they preferred to run buses in place of the streetcars every summer for the past 4-5 years (which is good thing, because the buses seem to run more reliably). Steve: Kingston Road was rebuilt to the “old” standard, and it was done in various stages. From Vic Park to Glen Manor was done in 1987, and from Glen Manor to Woodbine in 1988. The last piece, from Woodbine to Queen was done in 1989. However, this street does not have heavy service on it, and so the trackbed does not wear out as fast. This track has been on the TTC’s project list for a few years, but the work was deferred to let Toronto Water (whose project is now underway) get in there first. I believe that the trackwork is scheduled for 2013, at least for part of the project (I think it was going to be done over two years). Connaught to Coxwell does date from 1994 but it was built the “old” way as the TTC had not made a full conversion to the new style track yet. 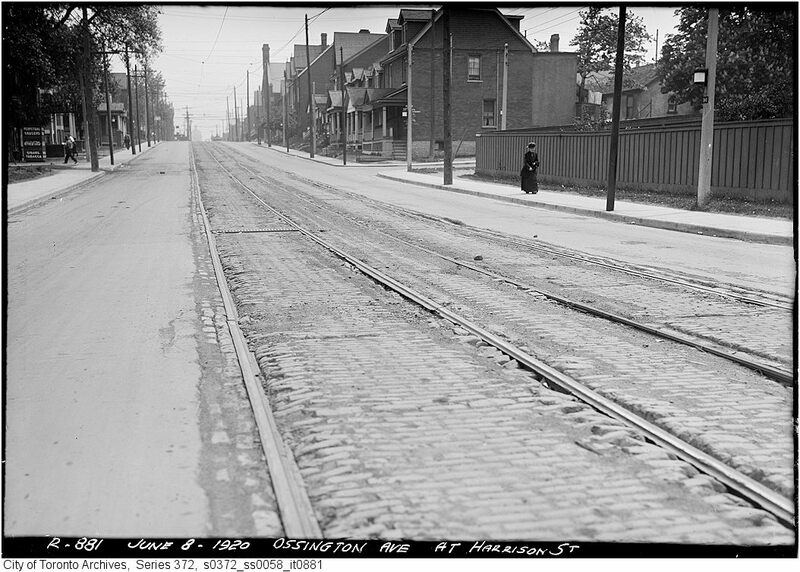 I was a bit surprised that it was rebuilt comparatively soon as it didn’t look in terrible shape, but suspect this may be related to Toronto Water tearing up the street at the same time and the fact that this stretch of track is much more heavily used than Kingston Road. On Spadina/Harbourfront, the original part of the line (south from King and east along Queen’s Quay to Bay) is now over 22 years old (the line opened in 1990), and the track is in rough shape in many places. It’s “old” track and also has some foundation problems on Queen’s Quay. The Spadina line north from King opened in 1997. The track now being replaced is at intersections (build to “old” standards), on the curves north of College (which wear faster than straight track) and at the tunnel portal at Sussex where, inexplicably, the track wasn’t particularly well built the first time around. The rest of the track on the line remains in service. There is an unusually large amount of track construction this year because some projects have been deferred. For example, the job on Queen at the carhouse was supposed to be done in 2011, but this was spiked by the Mayor’s office thanks to a complaint from the garden centre at the west end of the yard. The construction schedule this year was organized to maintain access to their building until September when the west exit from the yard will be done. Harbourfront is just starting now, and was constantly pushed back while the overall design and financing for the Queen’s Quay project was settled. There was a lot of emergency repair work that would otherwise not have been needed. Some other schedule changes were made to co-ordinate with Toronto Water (this is a result of fallout from past years when the same streets were torn up by different utilities year after year). The TTC has almost caught up to completing the reconstruction of the system and the elimination of the poorly-built track that is now pushing 20 years old. Intersections are still a challenge because they didn’t start the “new” construction style until much later on these. They are big jobs which shut down a neighbourhood for a few weeks (e.g. Queen and Spadina recently). I am waiting to receive an updated list of track projects from the TTC. Track renewal, Melbourne, (Yarra Trams). Interesting to compare to TTC track construction. Steve: I note that the removal of the old track is not unlike Toronto except that it is done on an industrial scale with many machines breaking up and removing concrete and old rails at one go. The foundation is dirt with some embedded conduits, and sitting on this are ties at a closer spacing than we see them in Toronto (likely necessary because the foundation isn’t concrete). Then comes the rail in strings on the ties with thermite welds between the strings (like Toronto). The big difference is that there is only one layer of concrete — the one holding the layer of the ties. The surface layer is asphalt, and there is no rubber sleeve around the track probably because the asphalt provides more than adequate sound insulation. Renewal of this track will be easy because the asphalt is easy to dig out and the layer with the ties can be recycled. This track is probably not intended to have heavy vehicles driving over it, and being Melbourne, does not have to deal with winter frost heaves and salt. Steve: This is a replacement of two nearside safety islands (one on either side of the intersection) with a shared island platform for both directions. The track layout is altered to suit the central platform location. Once again I note the foundation is earth, not concrete, and a lot of the track seems to be assembled on site. The intersection itself has only a diamond, no curves, and this makes changing the lane geometry comparatively simple. Steve: The construction is similar again with an earth base including utility conduits, then a layer of ties which are concreted in place, and finally the track layer which is in a layer of earth topped with asphalt. I note that there are pre-assembled track panels for the special work, but that these are delivered to the site and placed on a bed of ties laid out for the purpose. The parade of balloons flying by at dawn is a nice touch. As a general note, a larger amount of equipment appears to be used concurrently to speed the construction process and there’s a lot of equipment that has been built specifically to run on rails (e.g. the machine that pours and forms the asphalt). This is production line track assembly. Also nice to see simple, pantograph-friendly overhead that doesn’t look like it could handle heavy duty freight traffic. This is a streetcar line after all. Too many “LRT” systems overbuild their power systems and look ugly as a result. Finally, these are official videos from a system obviously proud of what it is doing. Thanks for providing these links. Oh yes. Beware the Rhino. And Beware the Rhino on Facebook. 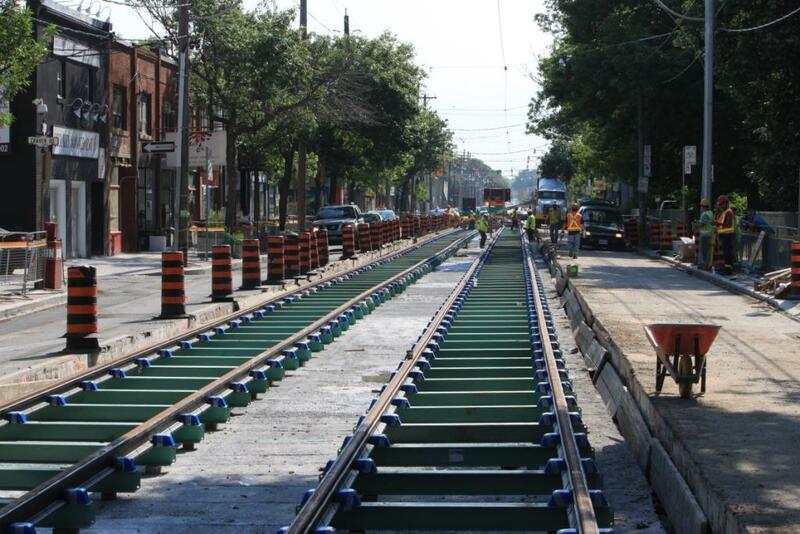 Steve said: I am waiting to receive an updated list of track projects from the TTC. It will be interesting to see how any list has changed from the last one you published in 2011. They are busily installing new poles for overhead all over the place, including on both Richmond and Adelaide (where streetcars have not been seen for decades) so maybe they are planning to relay those tracks soon. In my opinion the worst tracks (for streetcars and cyclists) are those on Wellington from Church to Yonge and Victoria north of Richmond. If the TTC were rational one would assume the new overhead will be put up to coincide with the introduction of the new streetcars on each route so an update on their overhead plans (if you can extract it) would be ‘interesting’ too. Steve: The TTC is running out of old track to rebuild. Other than the one-way streets downtown where work has been delayed by Toronto Water and countless high rise construction projects, all that’s left to do is Dufferin (September 2012), McCaul (fall 2012), Ossington, Bay, Victoria, Spadina/Harboufront (2012/3), Kingston Road (2013/4?). The story I got from one operator is that they are being given the choice of a CLRV or ALRV, and there are those who find CLRVs easier to manage in Queen Street traffic. Whatever the reason, I wonder if this is a byproduct of having a lot of spare CLRVs hanging around, what with Spadina and Harbourfront being down. 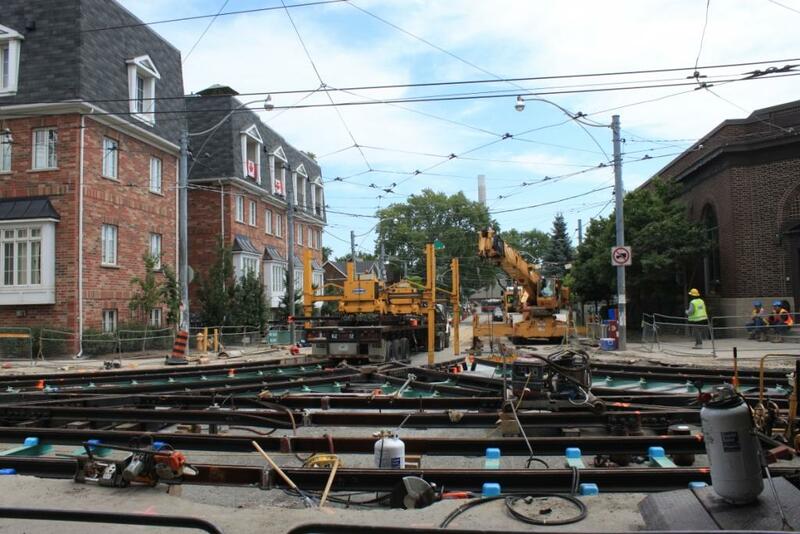 Of course, operational difficulties due to the Queen east track work may also mean that a CLRV is sent out because it can be gotten out of the yard. Fortunately riding is a bit lighter during the summer, with no school and good weather. I hope we’re back to ALRVs for the fall, or (perish the thought) more service. Because when ALRVs get crush-loaded to the point that half-a-dozen people are left at the sidewalk, how are CLRVs going to cope? The Garden Centre was on the news complaining how this construction would hurt their [business]. Yet every day I would past their store and most on street parking by the store was taken by their trucks. I counted 9 trucks one evening with one right at the front door. So if there business has hurt this year it’s not the TTC or City. It’s themselves to blame for taking up the parking spaces. Every time there is a Queen Street diversion in the east end, it is always a mess due to the lack of diversion trackage available. The bottleneck at eastbound Queen and Broadview is horrendous and that’s when things are running normally. I await the day for when the eastern waterfront Union-Broadview route comes online and joins the fray to foul up that intersection during future diversions. On a semi-related note, I noticed a car signed up with 503 Greenwood/Connaught this week. An unannounced scheduling change or perhaps a rogue operator? Steve: Operators running in to Russell pick whatever sign is handy for their destination. It could well have been a 504 because the op started scrolling in that direction. I see this at Broadview Station fairly commonly. The TTC website for the Queen diversion is indicating that as of Saturday, that with River Street now reopened, that the replacement buses will start looping (westbound) Queen, River, King, Queen. FYI Steve – it may not be a useful comparison regarding 501’s with all the extra time. Even though this is mid-Board they have started the ‘coffee-break’ or Service adjustment crews again running from the Russell Carhouse to Neville and return. Passengers remain on the car, the drivers switch both directions at Russell. Operators are telling me they are ‘flooding’ this small section because the inspectors do not know what to do with so many cars and so much extra time. For comparison sake, this sort of operation may not be very useful to you? Steve: But there should still be a major effect on the other end of the line too because no car should leave the east end behind schedule, and the need for west end short turns should be reduced. My purely on-the-ground observation is that short-turns are as infrequent now as they were before. However, the same runs seem to take an additional five to ten minutes. Used to be, the 7:08AM departure from Long Branch would get to Yonge around 8:05 plus or minus. Now it’s more like 8:10-8:15 and even 8:20.